Report the first case of a bilateral idiopathic facial palsy in a female young patient who received medical management for right side and early surgical decompression for left side, both with successful outcomes. A case report of a 15-years-old female with bilateral Bell's palsy. A 15-years-old female presented with right complete facial nerve palsy which two days later progressed to the left side, following an episode of herpetic stomatitis. Right facial paralysis responded well to medical therapy, however left side was refractory to antiviral, steroids and physiotherapy even after two weeks. Secondary etiology was rejected. Radiological imaging that is HRCT mastoid and MRI did not show any dura or nerve sheath enhancement or cerebellopontine angle tumor. Electrophysiological test showed left nerve degeneration. Three weeks after onset of symptoms, left facial nerve decompression was done via transmastoid approach. We succeed in recovering to almost normal facial mobility with electrophysiological test improvement 4 months postoperative. We present a case of Bell's palsy where two variable clinical courses can be seen with two different treatment options which were successful and improved patient's quality of life. Idiopathic bilateral facial palsy is a rare entity with an incidence range between 0.2% and 0.3% . Granulomatosis with polyangiitis disease, Guillain Barré Syndrome, Systemic Lupus Erythematosus and infectious diseases such as neurosyphilis, parotiditis or borrelliosis are the main secondary causes of peripheral bilateral facial palsy. Genetic diseases such as Möbius syndrome and neurofibromatosis type II are other differential diagnoses to be considered . After exclusion of these differentials, immediate medical therapy were required and only few cases will need surgical decompression. We present a 15-years-old female patient, with a history of herpetic gingivostomatitis who was treated medically. Two weeks later, she develops right peripheral facial palsy with grade VI House Brackmann (HB) classification. The initial medical management includes oral prednisolone and acyclovir. She progresses to grade VI left facial palsy after two days (Figure 1A). Otolaryngology examination showed normal otological findings, without cranial nerve affection or middle ear effusion or vesicular lesion. Complementary studies were performed. Serological test, IgG for Borrellia burgdorferi and Human Immunodeficiency Virus (HIV) ELISA were negative. Autoimmune screening including rheumatoid factor, Antinuclear Antibody (ANA), Antineutrophil cytoplasmic antibodies (c-ANCA), anti Rho, antiLA were all negative. C Reactive Protein (CRP), leucocyte count, serum creatinine were within normal and no proteinuria were documented. Hearing evaluation such as tympanometry and pure tone audiometry were usual. High Resolution Computed Tomography (HRCT) scan of the temporal bone and contrasted Magnetic Resonance Imaging (MRI) showed no evidence of space occupying lesion, dura enhancement or acoustic neuroma. After the extended study without positive results, the diagnosis of Idiopathic Bilateral Facial Palsy was done. She undergone three weeks of medical therapy supplemented by physiotherapy and her right facial nerve palsy improved to grade I HB (Figure 1B). However, the left facial nerve paralysis remains at HB grade VI. Electroneuronography test (ENoG) were done. It revealed poor response on the left side with a 93% functional loss and absence of voluntary electromyography (EMG) potentials (Figure 2). We proceeded to do a facial nerve decompression in its 2nd and 3th segments by transmastoid approach (TMA). Intraoperative findings exposed a discoloration of the left facial nerve within the mastoid segment, thus longitudinal incisions were made at the perineural layer (Figure 3). Progressive improvement of left facial motion was displayed within the first week after surgery. Four months later, a postoperative ENoG and EMG were performed showing conduction improvement with bilateral decreased recruitment patterns, multiple signs of reinnervation and left predominance dyskinesia. A follow up review six and twelve months after facial nerve decompression surgery were done. She regains almost complete facial mobility (HB II in left side and HB I in right side) which is supported by electrophysiological test improvement (Figure 4 and Figure 5). Simultaneous bilateral facial palsy is an uncommon disorder that usually results from a systemic disease, with only a few cases diagnosed as Bell's palsy . This case represents one of the few reported in young female and this patient is probably, the youngest ever. Only 2 of each 10 cases of bilateral facial palsy correspond an idiopathic origin. Abadi, et al. describes this entity as rare in the pediatric age and its study is important in ruling out concomitant infectious and neurodegenerative diseases . It is imperative that further studies are needed to look for the secondary cause, which Guillain Barré disease, Myasthenia Gravis and Neurosarcoidosis are on the top. Borrellia burgdorferi infection manifested as Lyme disease, is an important consideration that need to be excluded; tick contact represents its main risk factors . Izquierdo, et al. reports a case of a 47-years-old male patient with facial palsy and sensorineural hearing loss, secondary to granulomatosis with polyangiitis disease. T1-weighted, gadolinium enhanced magnetic resonance imaging (Gd-MRI) showed diffuse dural and symmetrical enhancement of the dural layer in the posterior, middle fossa, internal auditory canal and facial nerve within the tympanic segment . Sometimes, only smooth enhancement in the dural layer, could be enough for suspect neural edema and subsequent ischemia . Mastoid CT scan and contrasted cranial MRI can also rule out facial truncal agenesis or masses at the cerebrospinal angle. Patient management with idiopathic bilateral facial palsy includes medical therapy with systemic glucocorticoids, physical therapy and antiviral therapy . In 2015, the Cochrane database system review concludes that a moderate quality evidence exists, suggesting that the combination of antivirals and corticosteroids reduced sequelae of Bell's palsy compared with corticosteroids alone . Surgical intervention is reserved for patients who have a poor prognosis with observation or medical therapy alone. Byun, et al. found that patients with complete loss of facial nerve function, 90% or greater loss on ENoG testing, and absent volitional nerve activity on EMG have a 58% chance of a poor outcome- HB III or IV at 7 months of follow up . Surgical intervention may be beneficial for these patients in improving the likelihood of recovery of good facial nerve function. Awareness of the window of opportunity for facial nerve decompression is critical. An appropriate diagnostic testing with ENoG and EMG may be attained and surgical intervention should be completed within 14 days of symptom onset . Facial nerve decompression by transmastoid approach can be successful to as high as 35-50%, even in idiopathic causes . Facial nerve decompression has also been described through middle cranial fossa (MCF) approach, demonstrating a better results in post-traumatic facial palsy as it provides good access to the labyrinthine and perigeniculate ganglion segment. However, the types of surgical approach depends on surgeon preferences and complications pertaining to different access . Surgical intervention in the early stages of Bell's palsy are still controversial but it can be considered as an alternative management to avoid irreversible sequelae. Referring to this case, the authors strongly believe that patient's progressive left facial function recovery is attributed by the early stage of decompression surgery. We present a successful Transmastoid approach facial nerve decompression, without any complications. Prospective studies or randomized clinical trials are necessary to demonstrate the effectiveness of surgical management in the early phase of illness. The authors declare that there is no conflict of interest in the contribution of this article. Oosterveer DM, Bénit CP, de Schryver EL (2012) Differential diagnosis of recurrent or bilateral peripheral facial palsy. J Laryngol Otol 126: 833-836. Mario Alberto Lora Andosilla, Fanny Macia Brun, Carlos Arturo Cassiani Miranda, Rafael Ignacio Herrera, Marco Antonio Luján Agámez, et al. (2015) Parálisis facial periférica bilateral como presentación inicial del síndrome de Guillain-Barré: Informe de un caso. Acta Neurol Colomb 31: 440-446. Peitersen E (2002) Bell's palsy: The spontaneous course of 2,500 peripheral facial nerve palsies of different etiologies. Acta Otolaryngol Suppl 4-30. Al-Abadi E, Milford DV, Smith M (2010) A patient with bilateral facial palsy associated with hypertension and chickenpox: Learning points. BMJ Case Rep.
Jowett N, Gaudin RA, Banks CA, Hadlock TA (2017) Steroid use in Lyme disease-associated facial palsy is associated with worse long-term outcomes. Laryngoscope 127: 1451-1458. 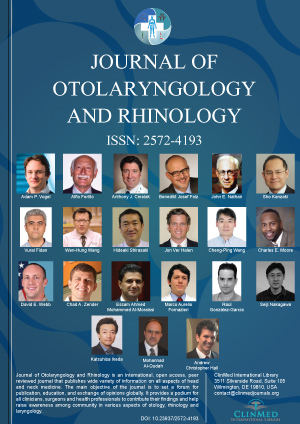 Juan Carlos Izquierdo Velásquez, Luis Felipe Romero Moreno (2018) Internal auditory canal dural enhancement in granulomatosis with polyangeitis disease. Case Reports in Neurological Medicine 2018. Shaikh ZA, Bakshi R, Wasay M, Dai A, Gosy E (2000). Magnetic resonance imaging findings in bilateral Bell's palsy. J Neuroimaging 10: 223-225. Engström M, Berg T, Stjernquist-Desatnik A, Axelsson S, Pitkäranta A, et al. (2008) Prednisolone and valaciclovir in Bell's palsy: A randomized, double-blind, placebo-controlled, multicenter trial. Lancet Neurol 7: 993-1000. Gagyor I, Madhok VB, Daly F, Somasundara D, Sullivan M, et al. (2015) Antiviral treatment for Bell's palsy (idiopathic facial paralysis). Cochrane Database Syst Rev. Grosheva M, Wittekindt C, Guntinas-Lichius O (2008) Prognostic Value of electroneurography and electromyography in facial palsy. Laryngoscope 118: 394-397. Bodénez C, Bernat I, Willer JC, Barré P, Lamas G, et al. (2010) Facial nerve decompression for idiopathic Bell's palsy: Report of 13 cases and literature review. J Laryngol Otol 124: 272-278. Takemoto N, Horii A, Sakata Y, Inohara H (2011) Prognostic factors of peripheral facial palsy: Multivariate analysis followed by receiver operating characteristic and Kaplan-Meier analyses. Otol Neurotol 32: 1031-1036. Kim SH, Jung J, Lee JH, Byun JY, Park MS, et al. (2016) Delayed facial nerve decompression for Bell's palsy. Eur Arch Otorhinolaryngol 273: 1755-1760. Romero Moreno Luis Felipe, Resident, Department of Otorhinolaryngology, Universidad Nacional de Colombia, Carrera 30 No. 45-03, Building 471 Office 225, Bogotá, Colombia, Tel: +57-3002980167, Fax: 57-(1)-316-5145, Conmutador: 57-(1)-316-5000, Ext. 15161. © 2018 Gilberto MP, et al. This is an open-access article distributed under the terms of the Creative Commons Attribution License, which permits unrestricted use, distribution, and reproduction in any medium, provided the original author and source are credited.